This recipe is all about sharing flavours. The bread soaks up the herby roasting juices of the chicken to give you the crunchiest, most delicious croutons ever. Preheat the oven to 180ºC/350ºC/gas 4. Rub the chicken all over with sea salt, black pepper and oil, and stuff with the herbs, reserving some rosemary for later. Tear up the ciabatta and scatter in a roasting tin. Crush and add the unpeeled garlic cloves, and place the chicken on top. Roast for 1 hour 30 minutes, or until cooked through and the juices run clear when the chicken is pierced with a skewer. Remove from the oven, cover and leave to rest. Roughly chop the tomatoes into different shapes and sizes. Keep half to one side and add the rest to a large bowl with half of the basil leaves. Keep the remaining leaves for later. Peel, finely slice and add the onion to the bowl along with a good splash of red wine vinegar. Scrunch the whole lot together with your hands. You want to end up with a colourful, tasty pulp. Taste and season, if necessary. Add 4 tablespoons of red wine vinegar with 2 tablespoons of olive oil and a pinch of black pepper, then give it all a good stir. Take the bread from the roasting tray and add most of it to the bowl (reserving a few pieces), and toss together really well. Destone and chop up the olives, and add to the bowl along with the capers and remaining tomatoes, bread and basil leaves. Mix gently to bring it all together and finish with a sprinkling of rosemary leaves and shavings of Parmesan. 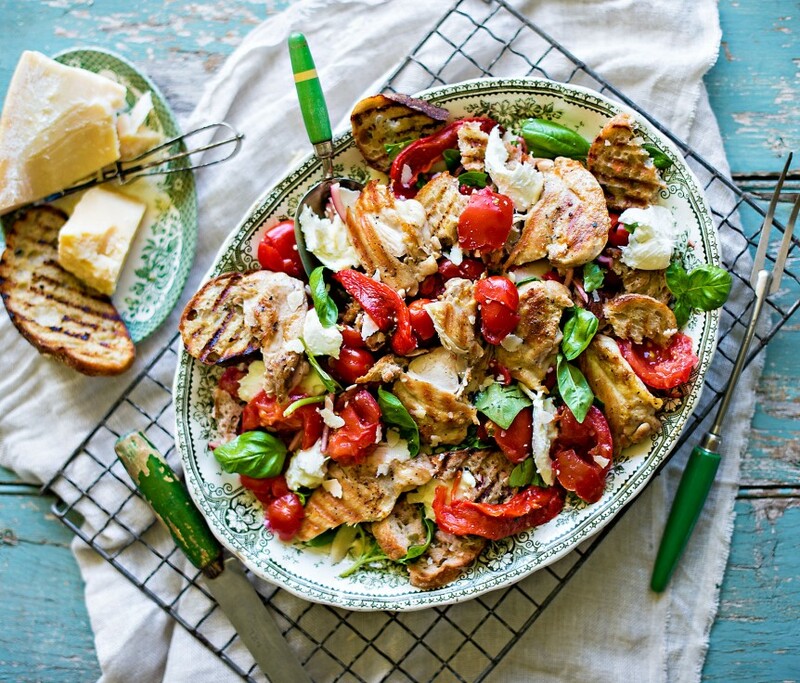 Carve the chicken and serve with the panzanella.